Peter Brod: Mr. President, more than a month ago the Hungarian parliament passed, by a large margin of votes, two amendments to the existing education law concerning the activities of colleges and universities that are registered in foreign countries but operate in Hungary. The amendments essentially say that foreign colleges and universities can operate in Hungary only under an intergovernmental agreement in each case, and that they are due to have a campus in the country of their origin. There are about a dozen of such schools in Hungary that could be affected by the law but everybody assumes that the amendments of the law were specifically aimed at what your opponents in Hungary call the ”Soros University“, that is the Central European University (CEU). The CEU is referred to in this way because its beginnings were financed by a large gift from the Hungarian-born American financier George Soros, a well-known critic of the Hungarian Prime Minister Viktor Orbán. Soon after its passage by parliament, the amended education act was signed by President János Áder and is therefore on the statute book. President Áder later called for “negotiations” and there is a deadline until 1 January 2018 for CEU to comply. Has anything happened in the intervening weeks to have changed the legal situation in any way? Michael Ignatieff: Well, the government claims that negotiations are underway but in the month since President Áder called for them, no negotiations whatsoever have occurred. It is possible that this week a consultation between CEU and an interministerial committee will start, but that has been postponed once and we have no indication that that will constitute negotiations at all. And in fact, the clock is running, the legislation was passed in April, and universities need to begin recruiting students for 2018-19. As you have pointed out, there is a deadline and we can’t accept any new students after January 1, 2018. Essentially, the legislation is a strategy of asphyxiation which means that we will slowly be unable to function. And we have resisted this, we are not “the Soros University”. We are extremely grateful for Mr. Soros´s generosity and his donation that made it possible for us to be independent, but we are independent of him and we are seeking to be independent of this vexatious, politically motivated, interference by a government that has a political agenda that we resist. The issue is that we are a free institution and this government has been systematically harassing the free institutions in this country and we are just the latest target. Negotiations about the new legislation? Peter Brod: You have mentioned the possible negotiations that are supposedly already going on but who would be the parties to such talks? Michael Ignatieff: Well, it would be the CEU in the first instance, but another potential party to the negotiations would be the State of New York because we are accredited in the State of New York. I think the fundamental issue today is whether we will be able to retain the freedom to award the degrees that we can secure accreditation for – that’s what academic freedom means in this specific instance. The government, I think, essentially wants to say “Look, you can stay and see... you can stay in Budapest but then why don’t you become an entirely Hungarian institution?” And we are saying that we have always been a Hungarian and American institution, proud of our double identity, compliant with Hungarian law at all times, compliant with American law at all times. The government has made a whole series of defamatory and essentially untruthful remarks about our status in Hungary. In fact, we have been completely compliant with Hungarian law. There’s no need for this new legislation. And we believe that even at this late date we can negotiate an agreement with the State of New York that would guarantee our American degrees and that agreement would then constitute that biding international agreement the new legislation calls for, and that if we can get such an agreement signed, then we will continue in Budapest very happily. But the whole episode is entirely unnecessary; it’s a crisis that the government has been making. They are a little surprised that we’ve resisted as strongly as we have, but they shouldn’t be. Universities have to stand up for their freedom, and we have done so. Peter Brod: With due respect to the State of New York, I was under the impression that what the government in Hungary had in mind were some kind of interstate negotiations with the federal government in the United States. Michael Ignatieff: Well, again, we pointed out, and the government of the United States has pointed out, that the government of the United States as a federal government has no jurisdiction in these matters. The accreditation of universities is a matter for the states. Just as in Germany, where the accreditation of German universities is a matter for the Länder (federal states – editor’s note). So, yes, the Hungarian government is calling for something that is not in the power of the US government to grant. I can tell you, the US government has been very clear and very explicit that they don’t have the power to sign the binding agreement that the legislation calls for. Peter Brod: You mentioned defamatory remarks that were made vis-à-vis the Central European University. There were many such remarks and strong statements in the run-up to the parliament vote. Hungarian Prime Minister Viktor Orbán for example said that your operations in Hungary were based on fraud. The Minister of Education, Zoltán Balog, said that the CEU was privileged, that anything of its kind could not operate for example in Germany, that a host of irregularities were discovered in the audit of the CEU for the last year, that there were courses without registration being offered by the CEU, that there are CEU programs that are not accredited and that the CEU does not know the number of its students. Have any of these statements been repeated since the passage of the new law? Michael Ignatieff: There have been repeated allegations and each and every one of the ones that you stated is false. It’s not merely that they are false, the departments and officials in the departments that accredit us and supervise our operations have said in writing that there are no irregularities in our file and definitely no illegalities. But these attacks have been repeated as recently as the hearings that the European Parliament held on this matter in late April, and they continued to be part of the message track of the government. And they are defamatory in the sense that they are an attack on the reputation of an institution that tries to the best of its ability to be compliant with all of the accreditation requirements and all legal requirements in two countries. And it’s worth pausing and noticing that it is utterly outrageous for a prime minister of a country to engage in this kind of defamatory attack on a free institution. This institution has never sought to be in politics. It’s a disgrace to have an elected official attack a university in this way, and it’s unthinkable in a country like Germany or the United Kingdom or France. Imagine if the French president attacked the Sorbonne; imagine if the federal chancellor attacked Humboldt University. People need to understand how absolutely outrageous these attacks have been. And that’s why we fought back, because they directly affect the intellectual and academic reputation of an institution that has been accredited in Hungary for 25 years. Peter Brod: You mentioned the debate that has been caused by the Hungarian move in Brussels in the European Parliament and elsewhere in the institutions of the European Union. In connection with the first voices criticising Hungary in Brussels in this respect, the Hungarian minister of state for education, László Palkovics, declared that the Hungarian government had no intention to close down any universities, it just wanted to “clarify some issues”. Can one see that as a sort of offer of compromise? Michael Ignatieff: Well, Mr Palkovics has said a lot of things, and he says one thing one day and one thing the next. The thing to pay attention to is that the legislation that was passed by this government says that effective October 11 they can withdraw out operating licence. Effective January 1, 2018, we can’t accept any more students. So the claim that they are not trying to shut us down is contradicted by their legislation, and that’s all I have to say about this. Peter Brod: There has been a lot of support from the opposition within both Hungary and outside, the world media have reported and expressed support for you like the New York Times. Tens or hundreds of universities, indeed, have also expressed support around the world; you’ve had the former secretary-general of the UN Kofi Annan criticising the Hungarian move; the Hungarian Academy of Sciences has recently passed a motion supporting you; various representatives of the European Union have spoken up for you, so did members of the US Congress and the US State Department. Do you think that this concerto of voices in your support can move the Hungarian government to adopt a softer position? Michael Ignatieff: We have had 650+ letters of support from institutions and associations from around the world and letters from 24 Nobel Prize laureates and we’ve been extremely grateful for this support. It’s come to us spontaneously and it’s been moving and I think it had a political effect. The support that actually meant most to us emotionally however has come from Hungary. I think that internationally it’s understood that the Hungarian Academy of Sciences has sided with us. Andrássy University, a German-language university in Budapest, has sided with us. Corvinus, ELTE, some of the great Hungarian universities have sided with us. And we’ve had 70 000 demonstrators on the streets of Budapest in support of free universities in a free country. I think of all responses and support we’ve had it’s the Hungarian support that has been most moving and I think also politically the most important support that we’ve received since the crisis began, and it makes the point which is essential to this, that we’ve been a part of Hungarian academic life and have no other desire than to stay here. Peter Brod: What about support in your eponymous region that is Central Europe? Is it strong in Poland, the Czech Republic, Slovakia, Romania, in the neighbourhood countries for which your university also has a special role? Michael Ignatieff: Well, we’ve had, I think the morning after the legislation was tabled and the word got out that we are under attack, we had a wonderful letter from the mayor of Vilnius, Lithuania, offering us a home. And then in the days following there was a letter from the mayor of Gdansk, then a letter from the mayor or senior official in Leipzig, Halle, and it goes on. A number of cities in the region, and also Prague I should say, have expressed willingness to host us if we were forced out of this country. And so that kind of support has meant a great deal to us. And I had to reply in every case that our only desire is to remain here in Budapest and we will fight to the last moment - we’ll exhaust all possibilities to remain here. But the support we’ve had from this region has been terrific, I should also add Bratislava, I’m losing track of the number of offers of support we’ve had from other parts of Central and Eastern Europe, and it’s been absolutely terrific. Thank you all if you are reading this, thank you all. Peter Brod: Your students and your faculty staff come from about 120 countries. Does Central Europe retain a special role for you? What do you see as the main focus of your work? 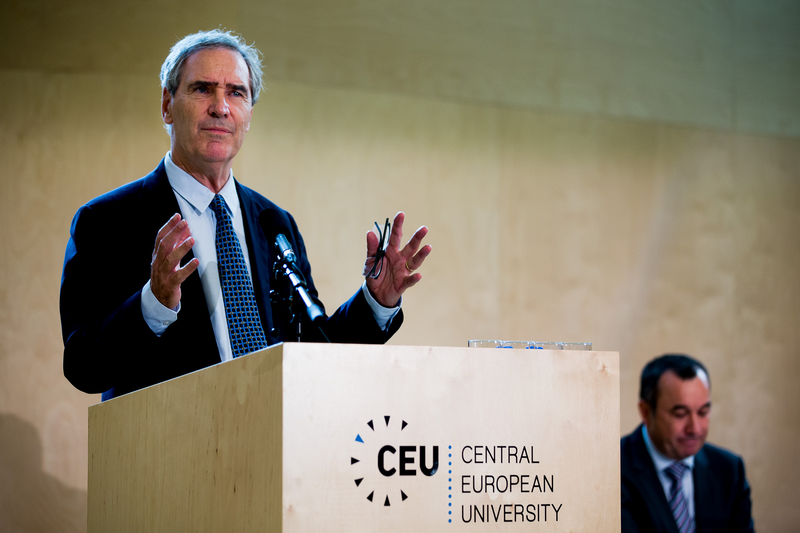 Michael Ignatieff: We were set up in 1991, in that blissful dawn in which we thought all the transitions in Central and Eastern Europe would lead to a liberal democratic and market-oriented future. And we’ve stayed true to that location ever since. The transitions have gone in unexpected directions, but we remained true to the original ideal that this part of the world can always use a good university in humanities and social sciences that trains people to be active and critical citizens. There are many fine universities in the region, and we know that, we want to join and partner them, I don’t feel we are especially unique, we are one of a network of institutions in Central and Eastern Europe that have done their part in the creation of democratic citizens for a region in the world that went through a terrible experience of tyranny. While we are now as you say a global university in terms of the citizens and the countries that we now appeal to, I think that the heart of our vocation as a university remains in Central and Eastern Europe, and Central and Eastern Europeans will always be a key part of our student enrolment. I guess what we have to offer to these Czechs and Slovaks and Poles and Serbs and Macedonians and Montenegrins and Romanians is to come to our schools and they then have an experience of global diversity, because with 120 nations represented in our student dorm, they certainly begin to live and enjoy benefits from an ethnic, religious, and ideological difference, and we think that that does make our story very special in educational experience. Peter Brod: Sometimes the policies of the Hungarian government are seen as part of a wider surge of populist and nationalist policies throughout Europe, and especially Central Europe, too, with such governments established in Warsaw and Budapest, but in Western Europe we have recently seen an upsurge of liberal forces expressed in the outcomes of the elections in the Netherlands and France. Do these developments give you reason for hope? Michael Ignatieff: I’m a hopeful person by nature and I certainly feel pretty good about Emmanuel Macron’s election to the French presidency, especially as I thought he faced into a populist storm of worry about globalisation, worry about national identity, hostility to Muslims, hostility in Europe, and stood up to all of it, and said France’s future is in Europe, France’s future is being in an international economy, France’s future is in welcoming its citizens and its visitors of Islamic origin, and all of that seemed to me as a good example of courage in politics, and I hope courage in politics will be contagious. As to the deeper question of whether there is a kind of a populist trend that has been turned back and a liberal trend is on the ascend, I don’t know if we can say that. And the reason is that some of the forces, and some of the anxieties and fears to which populist authoritarianism appeals, some of those fears are as present as ever, and some of the longings, and needs that highly nationalist political agenda serves are as relevant as ever. And they are relevant because pretty much everybody wants one thing from their political systems, which is some degree of control over their destiny, some sense that they are not helpless in the face of large impersonal forces like globalisation or large demographic trends like migration. The forces that fuel populism are all about “let’s get control back over our destiny”. Liberal politics, social democratic politics, and leftist and centrist politics, all have to address those fears and if they fail to address them, they fail to give people a sense of control. If a liberal progressive politics does not respond to those authentic fears, real fears, then the populists tide will surge up again. A liberal politics that is optimistic, wants to engage with the world, cares about justice, cares about solidarity, cares about fraternity will always be in a battle against forces that say the nation must be protected against outsiders, the nation must be protected against alien forces, the nation must be protected from globalisation. This battle will go on and on, it will swing backwards and forwards. And I think one of the mistakes that the liberals have often made is thinking that history is on our side. History is on no-one’s side. And we have to keep fighting. That’s what it is. It’s about a battle of ideas in which we have to constantly engage our opponents and reassure and speak to the fears of ordinary people. Peter Brod: Mr. President, thank you very much.